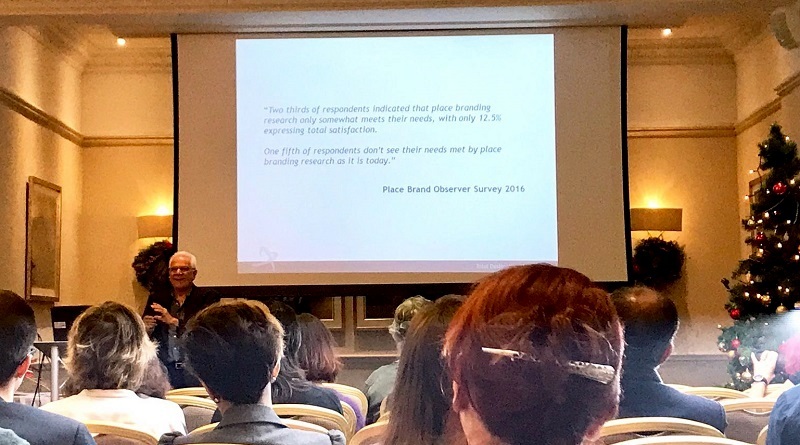 Felix Lossio, editorial assistant at The Place Brand Observer and doctoral candidate at Newcastle University (UK), sends us this summary of the recent International Place Branding Association conference, which took place in London, UK, early December. Last week, the International Place Branding Association (IPBA) launched its inaugural conference at Middlesex University in London. The aim of this first public event of the newly founded association was to bring together scholars, practitioners and students of place branding and related fields, and to provide a forum for the exchange of ideas around the theory and practice of place branding. The conference was divided in two parts. The first day was a doctoral colloquium, where doctoral students presented their work in progress to fellow students and a very helpful and strict panel composed by Keith Dinnie, Robert Govers, Charles Dennis, TC Melewar, Nigel Morgan, Mihalis Kavaratzis, Martin Boisen, Sebastian Zenker, among others. The second and third day was the conference itself, where dozens of researchers – academics, independent professionals and students – from around the word presented their findings and cases, often provoking stimulating discussions and debates. The perspectives offered covered disciplines such as business, branding, management, marketing, sociology, media, communication and tourism studies – a clear evidence of how complex “place branding” as research topic is, and how many opportunities there are for exchange of ideas and mutual learning in this multifaceted environment. All of these topics were anchored in cases and linked to examples of place branding in countries ranging from Japan to Peru, France to China, and the United States to Norway. Presentations of place brand strategies and issues in states, regions and cities included Medellin, Istanbul, Constantine, Toronto, Macau, Tasmania, Barcelona and many, many others. Beyond the specific cases, the conference offered four keynote speeches, delivered by Mihalis Kavaratzis, Olaf Berg, Marit Hovik Hartmann and Bill Baker, and a plenary debate. Those focused on a broader analysis of the place branding field in its current state, challenges and suggestions for future directions, such as the findings of a recent survey among practitioners about the usefulness of place branding research. While it is impossible to mention all the ideas, examples and challenges presented and debated at the conference, some “hot topics” stood out, not only in the public events and presentations, but also in the friendly coffee breaks, lunches and receptions. For example, the importance of acknowledging the interdisciplinary and multinational nature of place branding as research domain, and the need – and desire – to establish it as a proper field of study in its own right, which requires more research based on both qualitative and measurable, quantitative data. Some of the themes and potential paths to develop the field further, as mentioned across the panels and particularly in the plenary debate, were stakeholder participation and engagement, the need to pay attention to local level cases in the form of neighborhoods, the link between place branding and cultural policies, etc. Also, despite having been mentioned many times over, the still seems to be a need to remind place marketers in particular that branding, in a city/region/country context is not (just) about logos or slogans, but about developing policies and strategies, implementation and monitoring. Among the topics which fell short at the conference and worthy of more attention and dialogue is a deeper conceptual and contextual discussion, especially regarding the implications, possibilities and restrictions of place branding in a post “Brexit” (UK) and Trump (USA) context. While Robert Govers addressed those in his inaugural speech, I don’t think it was followed up in the subsequent discussions. Moreover, I believe that this conference has revealed several challenges, of which I will mention two. The first one, more institutional, is to balance the expressed aim of consolidating the IPBA as an international platform capable to (re)unite professionals interested in place branding as a very diverse research and practice field, with its equally important and ambitious objective to ensure the quality of research conducted on the topic, and to offer a critical position, where necessary. Hopefully IPBA will be able to do this, while keeping the international and interdisciplinary spirit as main added value. The second challenge is to open up and work on a conceptual and research agenda for the following five years: what do we need as a field of study which is still in its infancy? Which is our theoretical and methodological basis? This, not as an epistemological chain for the future but as form to solidify it and imagine new paths of study and action. A final suggestion for IPBA future events: engage with the city hosting the conference. For many, it was their first visit to London, one of the most multicultural and global cities worldwide. Even though it is obvious that time is always a heavy restriction for these events, we should think of ways to take advantage precisely of the “place” and learn about where we – place experts- are spending some days. Finally, the IPBA directors invited the attendants, members and public to submit their papers for publications -call for papers to be released soon- and to next year’s conference, which will be held in Swansea, Wales, in December 2017 under the auspices of Nigel Morgan. The IPBA conference 2016 has been an important stepping stone for our community and I cannot wait to see colleagues and friends in Swansea next year! Good reflections and suggestions Felix. Thanks! !